← Chapter 18: Can you Say Chickahominy? I have indicated the Nanneys hit the American shores in the early 1600’s. Another family that eventually made their way to my neighborhood was the Thomas Ledbetter family who settled first in Charles City County, VA, in 1635 (according to a paper written by his descendant Mary Ledbetter Morgan Peters of Ft. Lauderdale). Eventually their children made their way to western North Carolina. When I noted that two founding families came from Brunswick County, VA, about the same time, I thought they perhaps knew one another and were following friends or neighbors who had taken the leap of adventure before them. Wikipedia set me straight. Named for a German title possessed by a British Hanoverian King, Brunswick County was established in 1720 from Prince George County. (I think the names “Prince George” and “Virginia” are self explanatory) In 1732 the county absorbed more land from Isle of Wight County, and now it stretched from the sea to the Blue Ridge mountains until 1745. That is a lot of border crossing opportunities. While a philosophical debate was growing in Boston in the early 1700’s, and there was dissatisfaction in the colonies among the merchants who were being taxed by Mother England, the western edge of American civilization was already fighting a life or death struggle. Settlers were taking lands inherited by the hunters and gatherers who had lived here for unrecorded generations. And they did not like it. Some would not move away peacefully. The settlers felt safer in numbers, and they built forts. Although Richard Ledbetter had land inherited from his grandfather in Brunswick County, VA, he moved to the “Mumford Cove” area in NC with his wife Nancy Johnson, along with his brothers, George and Isaac, and his sister Mary and her husband John Bradley. Richard Ledbetter bought land adjoining that of John Potts. 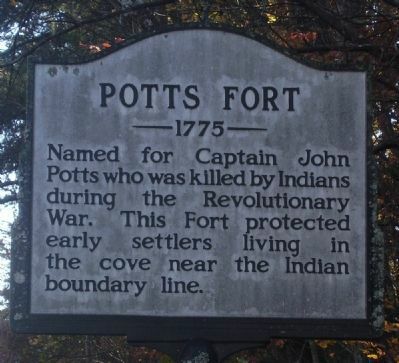 John Potts was killed in 1780 at this fort, but land grants to him were not recorded until after Tryon County was replaced by Rutherford County in 1782. In September of 1988, there was a dedication of an area where Pott’s Fort was believed to stand as the most western fort in Rutherford County. Ledbetter contributors to Mary Glenn’s archives suggested the site still had a cellar remaining, and it was located a couple miles west of County Road #1001, near the Harris Crossroads. The historical marker is at the intersection of Bills Creek Road and Landing Lane on Bill’s Creek east of Lake Lure area. Along with Forts Hampton, Russel, McFadden, McGaughey and Montford’s Fort, these sanctuaries were spaced in a rough semi circle about seven miles apart, with Fort McGaughey near Brittain Church being farthest east. An early settler, though not related to the Nanneys, was Andrew Hampton from England who first came to Virginia and then moved to Rutherford County. In 1770, he was made Captain, in 1776 made Lieutenant-Colonel fighting against Scots Tories, and in 1779 made Colonel, chasing the Tory party when they fled south. He served at Charleston, Earle’s Ford, Thickety Fort, Cane Creek, and commanded well at King’s Mtn and Blackstock’s. Fort Hampton, midway between Fort McFadden and Montford’s Fort was named after him. He was the Sheriff of Rutherford County in 1782, and I’m betting it was a peaceful town. Richard Ledbetter’s brother-in-law John Bradley served at the military Fort McFadden in the Mountain Creek area, south of Union Mills, where the Nanneys later settled. The land belonged to the McFadden family, three hundred acres bought in 1769 from Thomas Johnston. Here John Steven McFadden and his wife raised a daughter and eight sons who served in the Revolutionary War. Noah was lost to the British, and Elias was lost to a Cherokee raiding party. Before John Bradley could enlist in service, he died from an injury while working at Fort McFadden. 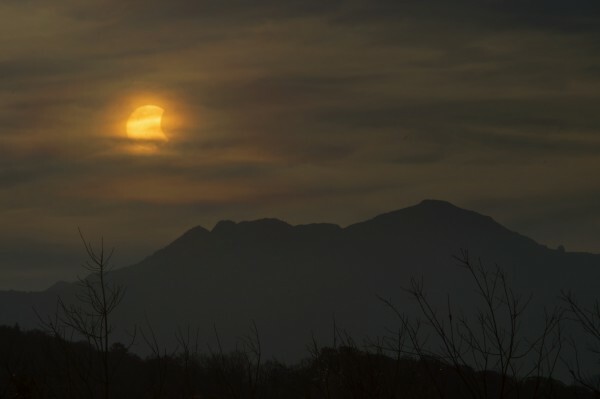 His descendant Austin Sherman explained that there was a total eclipse on June 24, 1778, and in the unusual darkness John stepped off a ledge. John’s son Richard Bradley represented the family well at King’s Mountain with the Overmountain Men and alongside neighbor Uncle/Captain George Ledbetter. Local Bradley descendants served in the Civil War, WWII, and Vietnam, according to Terry Bradley who assisted his cousin Austin Sherman in restoring a family graveyard. According to Scott Baughman’s article in The Digital Courier in February 2011, there are possibly 100 graves off in the woods in an estimated 10,000 square foot area. This was discovered recently because the children of Captain Ledbetter’s daughter, Rebecca Ledbetter Bradley, who died in 1825, got a new headstone in 1865. It was large and noticeable. And now the two Revolutionary War heroes will also have new headstones. I hope it will be open to the public. To read more about the Ledbetters, refer to The Heritage of Rutherford County, N.C., Ledbetters from VA by Roy C. Edbetter, 1964, The Richard Ledbetter Family of Rutherford Co., N.C. by Mary Ledbetter Morgan Peters 1969. Charles T. Wright, Jr. contributed information about the Whitesides, the first of that family coming from Ireland and marrying a local colleen Mary Underwood. They had three children, but he died in 1760. She remarried Irishman George Russell, had a child in VA, and then moved to Broad River where the Hickory Nut Gap Road crossed in what was then Tryon County. Their second child was born there in 1770 at what was known as “Russel’s Fort.” Mr. Wright suspects the home was built on the foundation of Russel’s Fort. The Rutherford Historical Society shows that spot for their marker. Their home was plundered by British Major Ferguson’s men as they roamed the county looking for cattle and food supplies for the British army headquartered at William Gilbert’s home in Gilbert Town later named Rutherfordton. Mary’s son John Whitesides, Jr., age 22, joined the Overmountain men in defeating Ferguson and the English at Kings Mountain. When he returned home, he declined any pension, saying he fought for independence and now he and his family could enjoy it. John and Eleanor Kelly’s first child was born at Russell’s Station ten months after the battle. They eventually had ten children, four of which married Ledbetters, and they did their best to populate this area. John’s brother Thomas Whiteside married Mary Kelly in Rutherford County in 1782. John’s stepbrother George Russell, Jr. moved to Missouri after his father was killed by Indians. Their mother Mary Underwood Whiteside Russell lived to be ninety-four years old. When I read that the Rev. Z.T. Whiteside moved into that house with his bride in 1884 and added a wing about 1893, and his son James Washington Whiteside lived there all his life, not putting in water and electricity until 1939, I considered the nightmare of having ten children one hundred years before those renovations. Kudos to John and Eleanor. 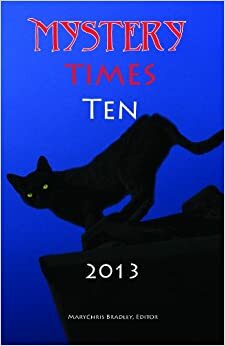 This entry was posted in Characters, Nanney Saga and tagged Fort Hampton, Fort McFadden, John Bradley, John Whitesides, Jr, Potts Fort, Richard Ledbetter, Russel's Fort. Bookmark the permalink. Just found your website. Such interesting information! I am decended from Mary Ledbetter Bradley and George Russell and M ary Underwood. Also decended from many other families of Rutherford county, N.C. I love the history connected with the county. Welcome, Carol. I am just now finding out that Mary Ledbetter Bradley was John’s second wife. The internet makes research easier then trading letters among relatives like the family did before 2000. I admire the many who were involved in getting their family history together. Please feel free to add or critique. I will be happy to post your request at the beginning of my blog. There are over 100 views each week on different chapters of the blog, and the great majority do not leave their names. Hopefully, your note will get a response. Glad to help. Thanks for reading and best wishes. Thanks Janice, please keep us informed of your search. And anybody else out there can jump in if you know the answer. Dialogue is good. I just found this. I am also a direct relative of John Whiteside. The old home place was where Lake Lure is now. Interesting material. Gary, welcome to family history. Please add whatever you want about your local family. Sometimes it takes awhile for readers to catch up. This blog is a work in progress.